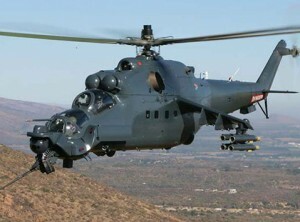 The Mi-17 helicopter, essentially a cargo helicopter offering a maximum internal useful load of 4 metric tons, has been designed and developed by the M.L. Mil design bureau. 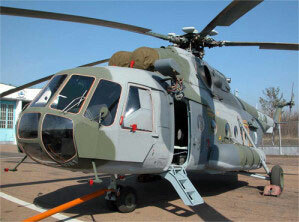 It is structurally similar to the well proven Mi-8 helicopter with universally recognised reliability. The helicopter is powered by TV3-117 turboshaft engines offering 1900 hp each at take-off. It is also fitted with a winch embodying a dynamometric safety system allowing a sling load of 3 metric tons. 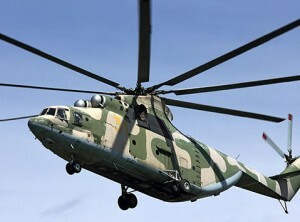 Further can be the Mi-17 used for passenger transport. The cabin is then heated and air conditioned offering capacity of 24 pax. Mi-24 (Export version Mi-35) attack/transport and gunship helicopter is conventionally designed with a five blade main rotor and three blade tail rotor. Two turboshaft engines are mounted above fuselage midsection. The body of helicopter has short weapons carrying wings mounted at the body midsection. The tricycle landing gear has retractable nose-wheel. Depending on version, helicopter can carry machine guns, antitank missiles, rockets and grenade launchers. Mi-24 is in service in 34 countries. The Mi-26 (NATO designation Halo) is a twin-turbine heavy-lift helicopter. It is the world’s largest production helicopter. The Halo’s development started in the early 1970s. The designer’s goal was to produce a helicopter with a load capacity twice that of any contemporary helicopter. The first Mi-26 Halo prototype flew in December 1977 and was first displayed at the Paris Air Show in 1981. In 1982, Russian squadrons received their first Halos, which were not fully operational until 1983. In 1986, India was the first country to purchase a Halo. Since then Halos have been sold to nearly twenty countries. Designed to meet a 1957 Soviet navy requirement for a new ship borne ASW helicopter, the first member of the Ka-20/25 family was the Ka-20 Harp, which initially flew during 1960. With more than double the power of the Ka-25 Hormone, the Ka-27 is a considerably heavier helicopter with a larger fuselage, but nevertheless offers increased performance with much-improved avionics and more modern flight-control system. 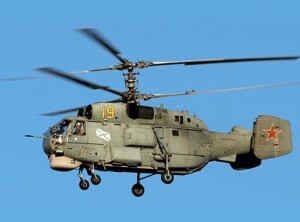 The Ka-31 airborne early warning helicopter is based on the basic Ka-29TB. 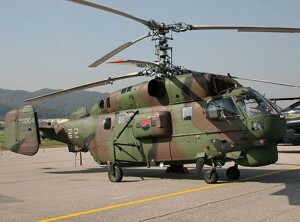 Originally this helicopter was known as the Ka-29RLD (Radiolokatsyonnogo Dozora, or radar picket helicopter). This AEW type first flew in 1988, and was first seen during carrier trials aboard Kuznetsov. 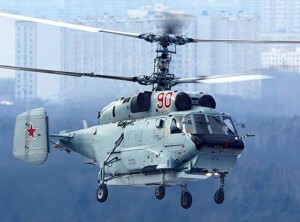 The main mission of the Ka-31 is a long-range detection airborne and naval threats. This helicopter can track targets over much larger horizon than ship’s radars. It makes it an important completion for naval task force, whose ships are too small to operate carrier-borne early warning aircraft.